Founded more than 30 years ago, AmInvestment Management is an award-winning funds management business based in Malaysia. A member of AmBank Group, the company provides investment services across several asset classes for individual and institutional investors. As of April 2014, AmInvest is responsible for managing approximately MYR37.5 billion in assets. AmInvest applies analytics and statistical modeling to find and exploit market opportunities on behalf of its clients. Fund managers in the Quantitative Strategies & Solutions team capture and analyze more than one terabyte of data from financial information services such as Thomson Reuters and S&P Capital IQ. The team uses the data to review company revenue, expenses and dividends—as well as price movements and economic cycles in several equities markets—to identify stock investment opportunities. “We store the data — which grows by nearly 200 megabytes per day—in our database and use various investment strategy research and portfolio management tools to conduct the required analysis,” says Huegesh Marimuthu, Fund Manager, Quantitative Strategies & Solutions, AmInvest. 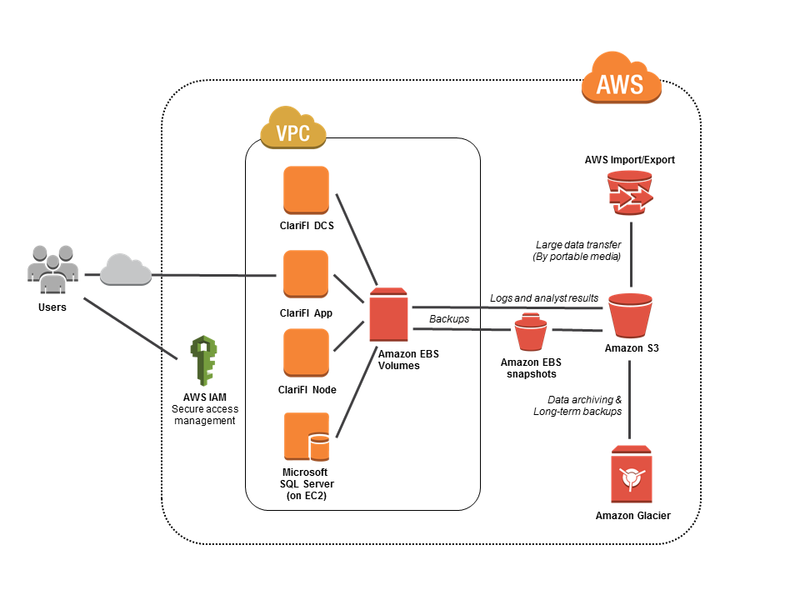 Prior to Amazon Web Services (AWS), team members used two in-house servers to house the data, create scenarios and test investment strategies. However, the analytic processes for these tasks were straining the memory resources of the servers. Each scenario could take up to two days to complete, compromising the team’s ability to provide prompt customer service. To continue to deliver fast, accurate client service, AmInvest decided to move its analysis and modeling applications and database from its on-premises environment to an on-demand, pay-as-you-go cloud infrastructure. Following a six-month evaluation, AmInvest migrated its research platform to AWS within three months. The company operates the environment in an Amazon Virtual Private Cloud (Amazon VPC) to ensure security compliance. The team use AWS Identity and Access Management (IAM) to control access: users need a password and a token to access the AmInvest Quantitative Strategies & Solutions environment over the Internet. AmInvest runs the environment on four Amazon Elastic Compute Cloud (Amazon EC2) instances, using one as an application server, another as a distributed control server, one as a node server for its ClariFI research and portfolio management platform, and a fourth for the SQL Server database. Amazon Elastic Block Store (Amazon EBS) is attached to each Amazon EC2 instance to provide storage for the application and database. Logs, analyst files and Amazon EBS snapshots are sent to an Amazon Simple Storage Service (Amazon S3) bucket for backup. Larger datasets are moved quickly in and out of the AWS environment using portable storage devices for transport, and are uploaded to the Amazon S3 bucket. All information is sent to Amazon Glacier for secure, low-cost and durable long-term archiving and backup. The division uses Amazon Support, Business-level, and Marimuthu reports, “the AWS team responds extremely quickly to web chat or email, minimizing the risk of any problems disrupting the environment.” Figure 1 shows the AmInvest Quantitative Strategies & Solutions platform on AWS. “By moving from an on-premises physical environment to AWS, the organization will save 50 percent over five years,” says Marimuthu. The team re-engineered its SQL Server database to optimize to scale out rather than scale up. This approach enables the team to run queries concurrently rather than sequentially, and take advantage of the ability to provision new Amazon EC2 instances quickly to expand database capacity. “The end result is that we have been able to reduce the average turnaround time required to complete scenarios by over 50 percent — improving the quality and timeliness of our service to clients,” says Marimuthu. The success of the running its research platform on AWS has given AmInvest the confidence to consider deploying the SAP Hana platform on AWS to analyze price and trading volumes at a more granular level, giving them the ability to identify new patterns and better service its clients. Furthermore, AmInvest reports that the platform hasn’t had any unplanned downtime since moving to the AWS Cloud, ensuring that applications and databases are available and minimizing the risk of a scenario being compromised and having to be re-run.